constitution | Send Down the Basket! The banners keep multiplying and the party alliances shifting, but I find it hard to get too excited about the parliamentary elections next week. Not because of any possible rigging, but because there’s some chance the results will simply be disregarded. For instance it is easy to imagine the parliament being sidelined in the drafting of the new constitution… or the constitution itself being sidelined… like the draft “constitutional principles” document that has provoked a big fight even though no one knows whether it will be binding or not. Remember all fuss about the constitutional amendments referendum back in the spring? Amendments were proposed to five articles of the 1971 Constitution, and the referendum kept civil society preoccupied for weeks. The “no” side objected, among other things, to the overly broad powers still granted to the presidency – they claimed the amendments were just a “tiny operation” (implication, according to this nasty ad subtitled by my friend Hazem Azmy: the amendments are like a hymen restoration surgery for a basically fallen system of government). The “yes” side spun the “no” vote as an effort to de-Islamize Egyptian law (since Article 2 said and would continue to say that shari`a is the basic reference of Egyptian law) and turned out in force to defend religion, spinning its resulting victory as “ghazwat al-sanadiq,” the holy conquest of the ballot boxes (as in this infamous video also subtitled by Hazem). All that seems like ancient history now. SCAF just annulled the whole constitution, amendments and all, and issued a new Provisional Constitution. Unclear why. Did they belatedly discover (!) that if the amended 1971 Constitution were left standing then their own rule would have no constitutional legitimacy, since it stipulates the Speaker of Parliament should take over if the president resigns? Or did they have some other reason? Was it their plan all along? Since then they have been ruling by proclamation, trial balloon, and Facebook page decree. Everything they do (as my teacher Sayyed Ismail Dayfallah points out) looks like improvisation but somehow has the effect of increasing their power. 1)	Make case-by-case decisions rather than general rules. 2)	Make rules, but neglect to publicize them. 3)	Make rules whose application is retroactive. 4)	Make rules that are too obscure to be readily understood. 5)	Make rules that contradict each other. 6)	Make rules requiring conduct that is physically impossible. 7)	Change the rules so frequently that behavior cannot be guided by them. 8)	In your actual administration, disregard the rules. Fuller’s prose is quaint, but his issues are relevant. The book grows from his deep concern with the legal system in post-Nazi Germany: how to move from a state of no law to a state of law? What to do with the remnants of the old regime (such as illegal laws)? How to create and enforce — and I think this is what the people of all stripes marching to Tahrir right now and tomorrow are demanding, and unfortunately they can do little more than demand it — a government bound by law? In a discussion of an al-Jazeera segment on “religion and politics” today, it finally came home to me what it means for a country to have an opportunity to write itself a constitution from scratch. Yes, I had known it before, but realizing it was huge. Imagine what would erupt if the U.S. were facing a moment like that, now, today, not in 1783? What kind of gruesome compromises would we come up with this time? (Assuming they were compromises at all and not fast-forward to the Civil War.) What an amazing crossroads to be at. This doesn’t happen so often in history. Unlike Iraq a few years ago, Egyptians have a relatively clean crack at a constitution, with no occupying army breathing down their neck. Or at least, only occupied by their own army. The military presence is far more obtrusive than before January 25. 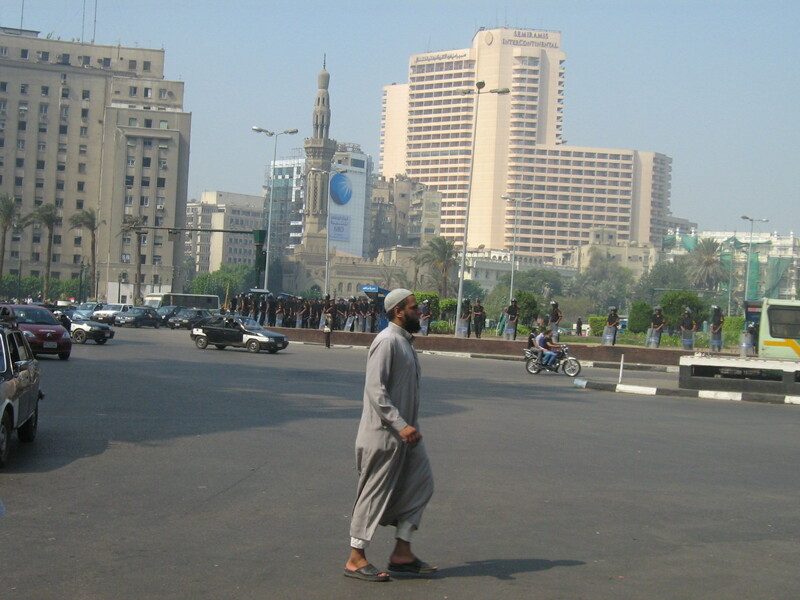 Look at the “Siniyya” (tray, or bowl) in the center of the Tahrir traffic circle in the photo above: ringed with state security guys even on an ordinary day. The next big demo (“miliyoniyya”) isn’t planned till Friday. I’ve heard several people use the word “qishra,” like a thin skin or vegetable peel or facade, to describe what this “revolution” has peeled off from the reality of praetorian rule — apparently this is enough of a cliche to have merited a whole Marxist analysis on Facebook months ago.